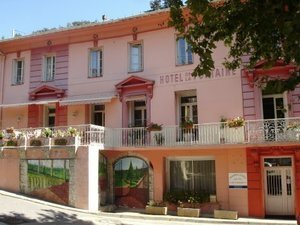 The 19th Century, La Fontaine, with its pretty pink facade, is located on the village square. All the non smoking rooms have en suite shower rooms and the majority overlook the village square. La Fontaine has a large lounge, two dining terraces as well as a dining room. Hugo will offer you a table d'hôte menu wih courses that are varied with Catalan as well as English dishes(starters, main course, dessert or cheese, coffee). The meals are freshly prepared using seasonal produce. The large lounge is furnished with antiques and provides a comfortable space for relaxing.The lounge has a satellite television with English TV programmes. We have four rooms for 2 people and a large room that can accommodate 4. Each room has a very comfortable bed and in addition feather filled duvets, an ensuite shower room and some a television.